This item ships free to the US, reduced shipping to Canada, March only. 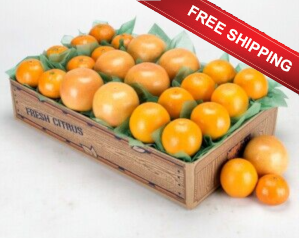 It&apos;s your last chance to enjoy Valencia Oranges, Honey Tangerines and Ruby Red Grapefruit, three amazing and distinct flavors, all in one box. A truly outstanding gift! What a great way to tell everyone up North that winter's cold is finally over and Spring is on the way. Sign up to be notified when Spring Trio is in season. Free shipping to us points, reduced shipping to Canada. Shipped in March only. The Spring Trio is available March only to the lower 48 US states and eastern Canada.